The 2016 Toyota Highlander Hybrid exhibits amazing fuel economy as well as a spacious interior. It also features an extensive roster of safety features for a multitalented and reliable family minivan. This year’s Highlander Hybrid showcases tons of comfort amenities and safety features, including Hill-start Assist, eight airbags, and a standard rearview camera. Its state-of-the-art technology includes Bluetooth and Toyota’s Entune smartphone connectivity. This versatile vehicle offers a great three-row SUV for up to seven passengers and is backed by Toyota’s reputation for quality and value. 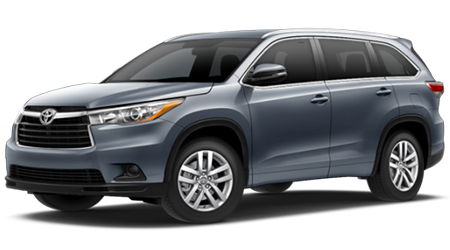 Check out the Toyota Highlander Hybrid and take it for a test drive here at Lipton Toyota in Fort Lauderdale, FL. Our sales staff is standing by and ready to serve our neighbors in Dade County and Broward County, FL. The added luxury in the Highlander Limited is immediately apparent. The latest design extends its stylish look with 19-inch alloy wheels and LED running lights. Inside the Highlander Hybrid, ambient lights about the dash and doors adds a touch of stylish elegance, and ample conveniences increase the luxury level significantly. Seating for seven passengers includes second-row captain’s chairs, ventilated and heated front seats, perforated leather-trimmed seats, memory settings for the driver seat and side mirrors, and a 4-way power passenger seat. The 2016 Toyota Highlander Hybrid gives you two trim levels to choose from – the Limited or the Limited Platinum – both all-wheel drives. The 2016 Highlander Hybrid Limited Platinum level adds a panoramic moonroof with power sunshades along with rain-sensing windshield wipers. The Highlander Hybrid take your breath away with muscle and efficiency. And, it’s the most powerful Toyota Highlander, generating 280 total horsepower with the Hybrid Synergy drive system that merges a 3.5-liter V6 gasoline motor with a high-torque electric drive engine-generator. It’s the Hybrid’s most fuel-efficient Highlander with EPA-estimated 27 mile-per-gallon for the city, and 28 miles-per-gallon on the highway for a dazzling 28 miles-per-gallon combined fuel economy. The 2016 Highlander Hybrid highlights the Star Safety System, which features Eight standard airbags, Rear Cross-Traffic Alert, a Blind Spot Monitor, and Traction Control. It also includes Smart Stop Technology, Enhanced Vehicle Stability Control, Electronic Brake-force Distribution, Rear Sonar Parking, Anti-lock Braking System, and Brake Assist. Additionally, the Highlander Hybrid comes primed with a standard backup camera and Hill-start Assist Control. For additional Safety features, there’s the Driver Technology Package, which adds: Safety Connect -- Emergency Assistance, Stolen Vehicle Locator, and Roadside Assistance (Available by subscription). It also adds Lane Departure Alert with High Beam Headlights; Automatic Collision Notification; and Pre-Collision System with Dynamic Radar Cruise Control. The 2016 Toyota Highlander Hybrid’s a great family crossover utility vehicle whether you’re sprinting through the city or you’ve set out for an extended highway vacation. It’s front-strut, and independent-rear suspension presents an outstanding responsive handling that makes it an absorbing car to drive. 2016 Toyota Highlander Hybrid imparts a comfy, eco-friendly ride, plenty of room for people as well as cargo, and a full catalog of high-tech safety features. You’ll get outstanding customer service and our best price when you purchase a reliable, Toyota Highlander Hybrid at Lipton Toyota in Fort Lauderdale, FL where we welcome our neighbors in Dade County and Broward County, FL.